Bernheim tracking golden eagle pair, possibly first pair tracked in eastern U.S.
Clermont – Bernheim officials announced today that they are now tracking a second eastern golden eagle, a female and companion of the male raptor they have been tracking for four years. 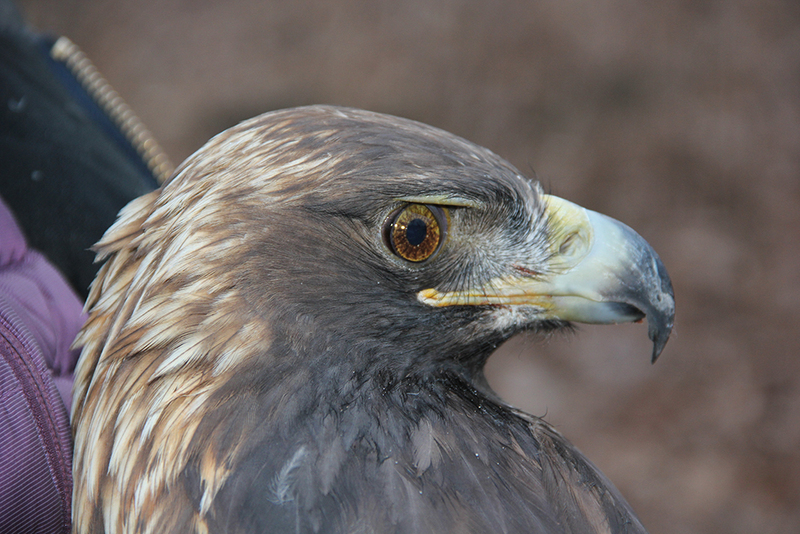 The project is believed to be the first pair of golden eagles tracked together in the eastern United States. Bernheim officials cited the large forest block habitat that Bernheim provides as critical to the preservation of this magnificent species. In partnership with Cellular Tracking Technologies and Conservation Science Global, the Bernheim team briefly captured the nearly 12-pound majestic female and outfitted her with a GPS satellite transmitter. They are now able to follow her movements along with Harper, the male eastern golden eagle they have been tracking since 2015. Like her companion, Harper, Bernheim is calling on the public to help in name the female eagle. Harper is named for the brand of bourbon Bernheim’s founder Isaac Wolfe Bernheim sold. ● Goldie: for the beautiful golden feathers on the crown of her head. ● Athena: for the Greek goddess of wisdom, courage and inspiration. ● Persephone: for the Greek goddess associated with the changing seasons. Voting is now open at bernheim.org and ends on Wednesday, Feb. 13. Bernheim will announce the chosen name on Valentine’s Day. Berry said eastern golden eagles are thought to mate for life, but we do not know how or if they migrate together to Bernheim Forest in the winter. If this ends up being a breeding pair Bernheim can learn how a pair of golden eagles interact during migrations, at Bernheim Forest, and on their breeding grounds in Canada. He called the research opportunity extraordinary for a conservation organization like Bernheim and pointed to Bernheim’s size (16,137 acres) as the reason why Bernheim Forest is a winter destination for several eastern golden eagles. 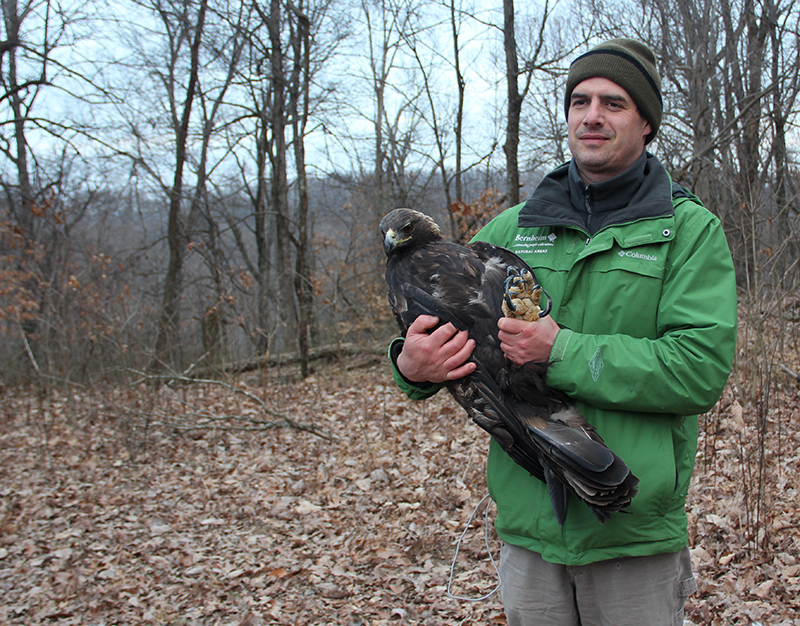 “Kentucky’s golden eagles need large forest blocks to survive the winter. This project has shown that golden eagles at Bernheim avoid inhabited areas, staying within 5000 acres of protected interior forest.” said Berry. Berry expects the golden eagles to be at Bernheim through early March and then head north to their summer nesting grounds in Canada. The data Bernheim collects is being shared with others in the golden eagle research community, working together to expand the knowledge and protection of eastern golden eagles. Bernheim’s Executive Director Mark Wourms, Ph.D. said being a part of an interstate and international research effort demonstrates Bernheim’s leadership in conservation. According to Wourms, eastern golden eagles found in Kentucky during the winter are distinct from the more abundant population found throughout the western United States. These birds have minimal interaction, if any at all, with the western population. “We are thrilled to watch and learn from these two eastern golden eagles that appear to be companions. We will learn more as we track their movements,” he said. Wourms called the timing appropriate given the upcoming Valentine’s Day holiday. The public can follow the golden eagle research project at bernheim.org/golden-eagle-research. Regular updates will be made as the team at Bernheim follows the journey of the two eagles. Wourms thanked the Beckham Bird Club and private donors for funding this important research and continuing Isaac W. Bernheim’s legacy of conservation. He called a research project of this magnitude very fitting in light of Bernheim’s 90th anniversary.